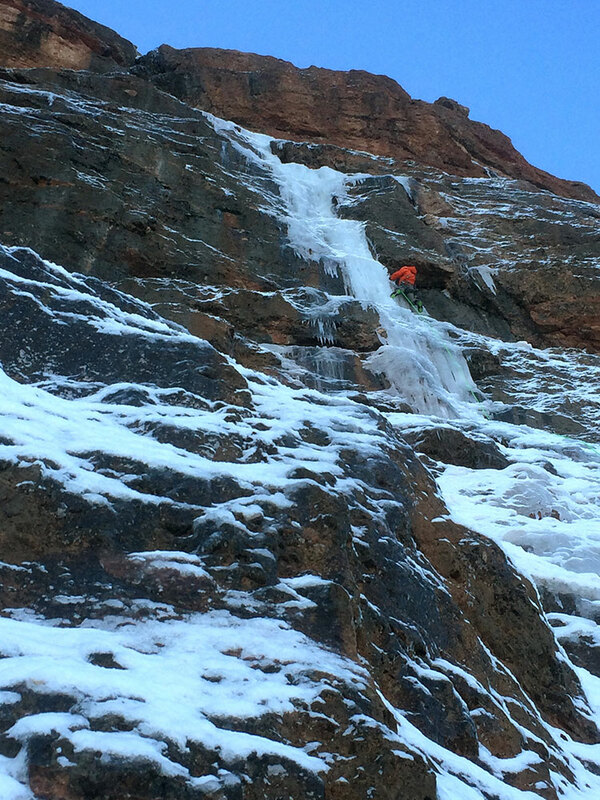 It’s early season ice climbing in Montana. You can often approach in your tennis shoes, should carry bear spray, wear hunters orange, and plan to walk a ways. 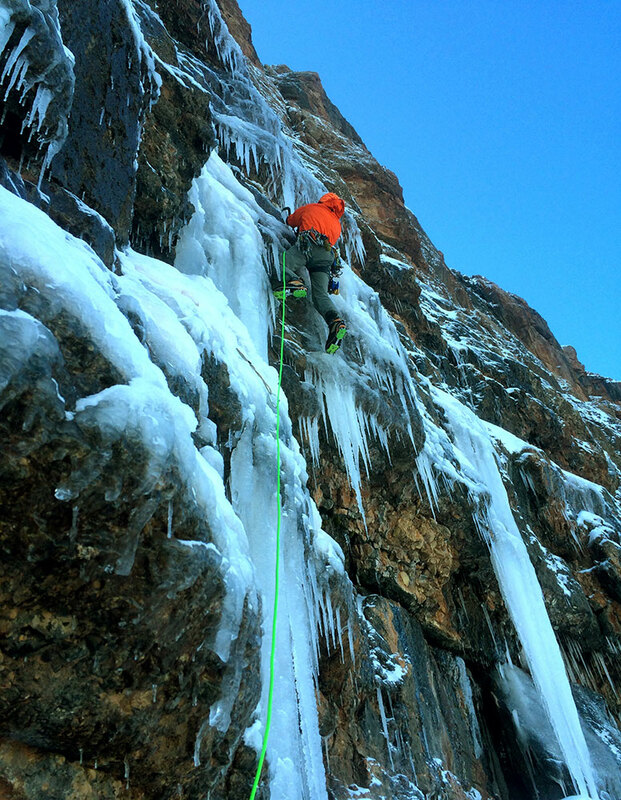 Ice routes can come and go with the fickle weather of shoulder seasons. 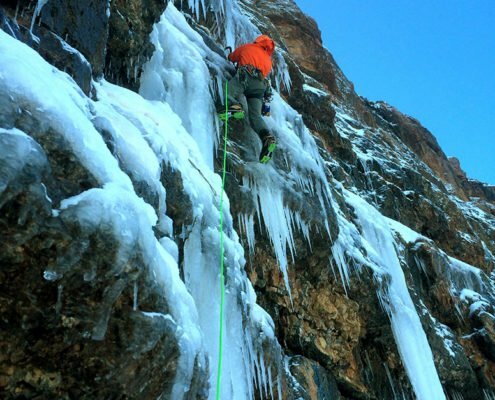 The obvious recipe needed for this early season ice is typically: a north face, higher altitude, melt and drainage to feed/form ice, and fluctuating day/night temps from above freezing to below. In many cases the approaches can be dry making it ideal to wear comfortable tennis shoes rather than alpine boots for the walk in. Grizzlies and hunters are out and about so it’s highly suggested to bring bear spray and wear orange on those early ice season endeavors. P1 40m steep and thin, bad gear but fun climbing. Lots of ways to go, this party went straight up because it seemed the most fun. P2 60m WI5 starts thin gets rad! Can stop at nice cave around 50m up if you run out of rope, but the v-thread is exactly 60m from the belay. Descent: This party rapped and climbed the earl Trimble to escape. Bears: Lots of tracks, no sightings. Snowpack: On 11/2/16 it was generally quite stable on the Sphinx, but that can change in one day. There is a base in many places of pencil hardness rounds, moist at the base, dry above. 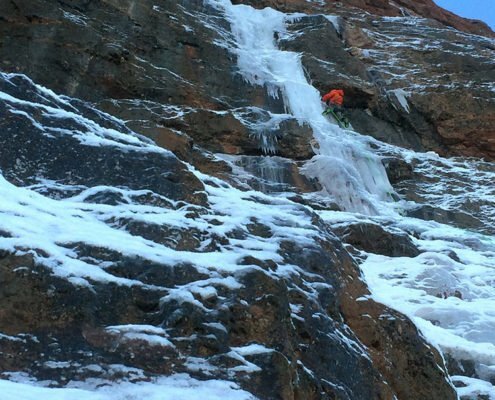 The slip and fall hazard seems greater than avalanches. Towards the end of the traverse there was a lot of funky crusts and plenty of light snow available for transport, watch out here if it gets windy or we get more precipitation. No noted signs of natural avalanches. NOTE: This is merely an observation. Always assess the snow yourself and check in with GNFAC for the latest forecast. 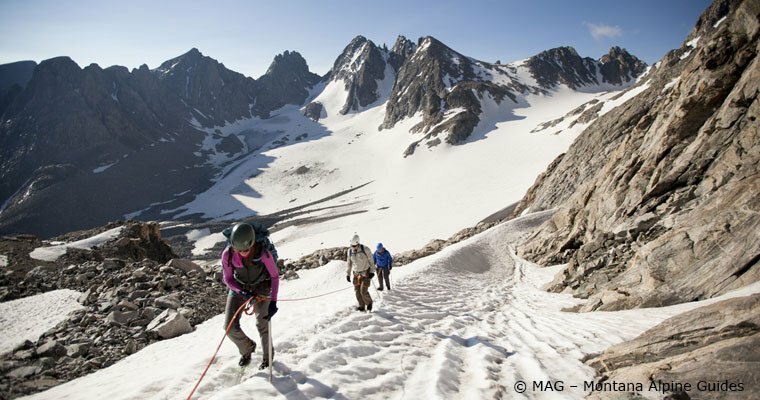 There are a number of avalanche courses being offered locally to get educated, including upcoming courses by MAG. Ice: everything is still in fat, doubtful that Lowe direct p1 came back in post melt out.